Using local studies to answer global questions, this compilation challenges traditional notions concerning historical Chinese population trends. Genealogies, epitaphs, and household registers are some of the local and primary materials used to examine the important issues of fertility, mortality, family structure, and migration patterns. 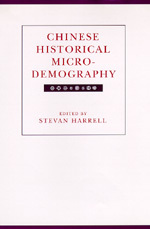 Stevan Harrell is Professor and Chair of the Department of Anthropology at the University of Washington and coeditor of Chinese Families in the Post-Mao Era (California, 1993).